For those of you who are still following this blog, and hopefully more to come, my last post was more about the inspiration and prototypical history of 20" gauge and On20 modeling. However in this post I will go into the history of my Ocalla Tramway and its evolution to the concept it has become today. 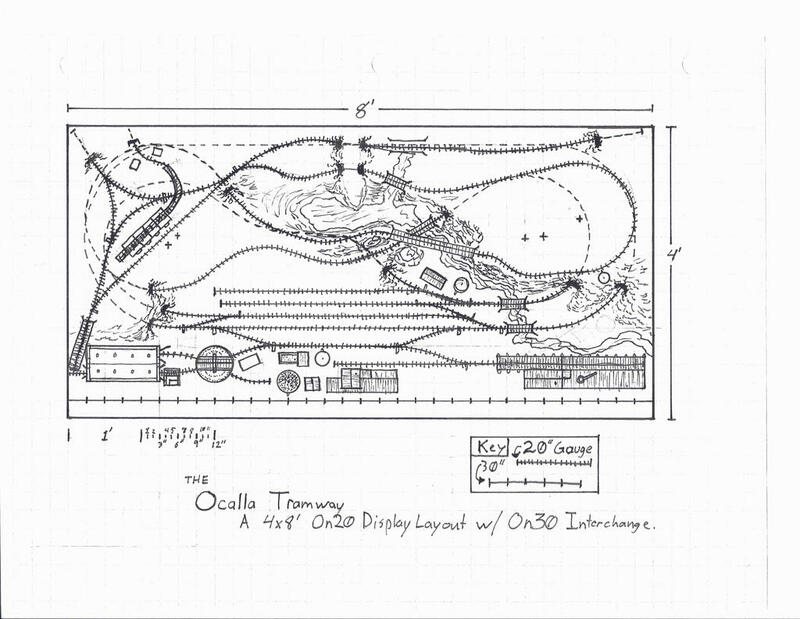 The Ocalla tramway started off on what would be a Colorado based On30 layout featuring a Figure 8 design. The tramway being nothing more than an On18 mine train to take ore cars from the mine to the mill. And the tram didn't even have a name then, but as my interests broadened and shifted west of the Rockies (and a rekindled interest in Disney railroading) I decided to relocate the layout's geographic location to the arid, southwestern deserts of Arizona. The goal being to create a railroad that is a plausible blend of fantasy and reality. I also greatly loath most stereotypes, so the aspect of gold mining was thrown out the window right away. Sorry, no gold mines here. Instead I favored copper mining, which not only breaks the stereotype of gold and silver, but also has some historical significance to Arizona's history with narrow gauge. At the time I was still set with On18 as a scale and gauge combination and so I went looking for not only examples of On18 modeling, but examples, tips and tricks also. There is a lovely group on Yahoo! focused on On18 and I found it quite inspirational. Along with looking for modeling inspiration I was also looking for prototype inspiration as well. I came across an old issue of the Narrow Gauge & Short Line Gazette that had an article about an On18 Porter. Not too long after that I learned about the 20" gauge in Arizona. Then one day I was browsing the On18 Yahoo! group and in there links section I say a group for On20. Curious I decided to check it out. I joined and looked around a bit. Although On18 is a wonderful scale/gauge, and I'll still use it for some mine tunnels, On20 had exactly what I was looking for. It didn't take me long to be sold on On20. Unfortunately the time and the resources to build my On30 layout were not available, and still aren't, but that wasn't to say I couldn't start out small with portable micro layouts or something. And that's still an option for the time being. This was my first real inception for what would become the Ocalla Tramway. A fairly small 2x8ft modular layout with On30 interchange and/or On30/On20 dual gauge track. And yes, the "4ft" markings on the end are a mistake. Anyway it's not much and it's pretty simple. However it lacks the ability to have continuous running, and if I want to take this to a model train expo continuous running would help in terms of ease of operation. I have gone through many track plans, sadly none of them I have scanned, but I did finally settle on one track plan. It's not a micro or modular layout, it is a 4x8. The idea is that it still can be a portable model railroad that can be brought to model train shows for display and promotion of On20, but can also be a stand alone layout when not "On Tour". And this is the current edition of the Ocalla Tramway. It is a 4x8 with an oval for continuous running, though most of it is hidden. The part of the oval running along the back side with have "Cut Aways" so that the train can be viewed as though it were passing through a long tunnel. It features a small yard with an engine facility and an On30 interchange with the Big Thunder & Western RR. The main line runs up to the mine(s) in the upper left hand corner along sharp curves and steep grades. Most of the structures will be scratch built or heavily kit-bashed. Equipment for the line will mostly be comprised of 4 wheel motive power and rolling stock, along with a shay, possibly 2. Well, i wish I could add more here that is visually interesting, but alas this is all I got for now. In my next post, though, I'll be going over motive power and equipment the Ocalla Tramway will use to haul ore from the mines to the interchange!